Project obstacles and solutions: VanTrust Real Estate made plans to design and build a spec warehouse in Whitestown, Indiana. In the midst of construction, a tenant was found for the building. AmerisourceBergen Drug Company entered into an agreement with VanTrust to open a wholesale drug distribution center in the building. However, the nature of their business caused the plans for the building to change drastically, right down to the concrete. The floors of the 529,000 square foot distribution center were originally specified at a 650 psi flexural strength. The heavily regulated drug industry requires 700 psi flexural in floor slabs on grade. At that point, 3,500 yards of concrete had been poured. The floor mix was replaced to meet this specification. The remainder of the floors were poured with a 6 x 6" rebar grid. IMI QC/QA designed a new mix to accommodate this. Since the rebar was spaced so tightly together, Pepper used two concrete pumps to eliminate concrete surging out of the first pump hose that might have caused repositioning of the rebar. This was also taken into consideration when designing the new mix. Coarse aggregate gradations were changed to make sure the concrete would pump smoothly and slumps were carefully monitored to make sure the concrete was workable. The job schedule also changed with the new tenant requiring possession in 3.5 months. 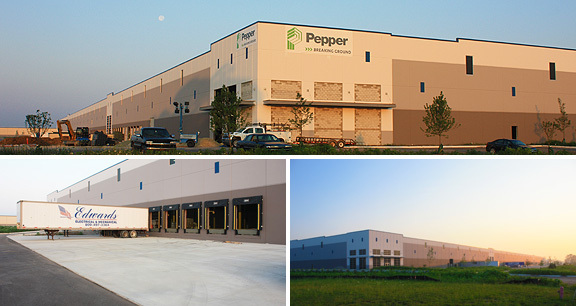 Pepper Construction put the project on a fast track that required work crews and suppliers to put in extra time and effort to make the deadline. IMI delivered 16,000 yards of concrete for this project. One concern was the tight flatness tolerances for the floors. Flat and level floors are a product of several factors, including construction of forms, levelness of subgrade aggregates, the concrete mix and finishing techniques. On this project, the collective effort of the crews and the suppliers produced extremely flat floors. For more information on achieving super flat floors, contact the sales representative for the concrete plant nearest your location. Click here.